Early every Saturday morning, while the dew is fresh on the grass and Templeton is waking up, farmers from around the county and beyond are gathering around the Community Park at 6th and Crocker Streets to set up for the weekly Farmers’ Market. 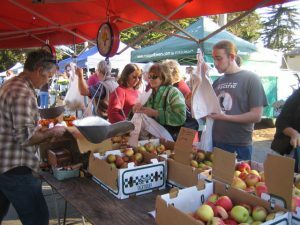 Since 1983, Templeton has hosted the largest Farmers Market in the North County. Sponsored by the Templeton Chamber of Commerce in its early years, the market is now owned and operated by the farmers who participate in the market as the North County Farmers Market Association. Being a California Certified Farmers’ Market, all of the farmers and food vendors sell only products that they have grown or made, no re-selling is permitted. And what a variety of delicious products you’ll find!